July has gotten off to an exciting start, with festivals and celebrations and explorations and plenty of fun in the sun. While working is still an ever present activity, I realized again the other day that for the first time I actually have time to enjoy the summer. I am not working from 7 in the morning until 6 at night (as I have in the past), and even though I worked 13 hours yesterday I had time to relax outside, watch a movie, and go for a walk. Most of the time I feel like I have every day off, since working at 3:30 gives me the whole day to play. I can’t complain much, even about the three days a week when I work my morning job as well. 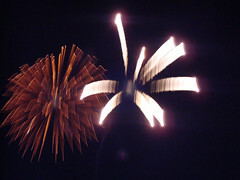 After all, it was due to my various jobs that I enjoyed the 4th of July to the extent that I did. I have lived here for the past 3 summers, and this was the first time that I attended almost all of the Bar Harbor 4th of July festivities. It began in the morning with my roommate and her sister and I rising at the crack of dawn (5:45 a.m.) to stumble down to the Y field to partake in the Rotary’s Blueberry Pancake Breakfast, before we went to our various early morning jobs. I then spent a few hectic hours at Our New England Country Store making coffee drinks for members of the reportedly “tens of thousands” (according to the Bar Harbor Times) who flocked to Bar Harbor to watch the parade. My boss kindly closed the store for an hour so that we could join the throngs and watch the parade ourselves. It was pretty good, if I do say so myself, the highlight being the little Shriner cars, which sped around and drove over a ramp that was built on top of a full sized car. I went back to work for a few more hours, then had some time off to go and have lunch with a friend at the Thirsty Whale. Back to work then at the next job, although not for long. In deference to the fireworks Reel Pizza only showed the first shows of the evening, and then closed. We were out of there by 7 o’clock. I went to the Village Green with my friend Julie and we found more friends and sat and listened to the band play in the gazebo for awhile. Finally it was time for the highlight of the day, and we trooped down to the harbor, where we had staked out the perfect spot to watch the fireworks from. We sat on the rocks just past the dock for the Margaret Todd, camped out comfortably on blankets. I felt like I had “connections” since I had never dreamed of having such prime seats. We watched the sunset and then the fireworks, which were pretty spectacular, exploding in showers of colors above the Porcupine Islands. A good day, and an excellent 4th of July! 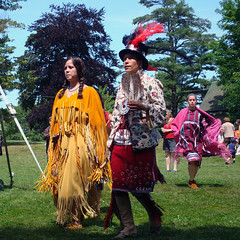 The following afternoon, in another break between my morning and evening jobs, I hooked up with Julie again, and we went up to COA to attend the Native American Festival. I had heard about it through a co-worker at the Country Store, who’s family is Navajo and owns Native Arts just down the street. He mentioned in passing that there would be a booth selling Navajo tacos. I nearly came out of my skin with excitement! Memories of my childhood in New Mexico – the Navajo ladies at church making taco’s at potlocks – flooded me. I absolutely HAD to go. Having infused Julie with my own enthusiasm, we dutifully wandered the booths and placed bids at the silent auction. Then, having caught sight of the so called “Indian Tacos”, we made a bee line, were served up deliciousness on a plate, and found a seat near the dancing that was taking place. We watched the dancers and listened to the drumming and singing, and devoured our Navajo taco’s with relish. I was extremely pleased that Julie enjoyed hers so much – a new convert. But then, there are few things as wonderful as fry bread and beans and cheese! My weekend had just begun, I discovered, for Sunday dawned sunny and warm, and I got it in my head that it was the perfect day to drive to Bucksport to check out Fort Knox and the new bridge over the Penobscot river. I collected a friend, and we set off. 45 minutes later we drove across the new Penobscot Narrows Bridge, and pulled into Fort Knox. We went first to check out the Observatory tower. I am a bit of a bridge geek, so indulge me here for a minute while I relate why the new bridge is SO fabulous. 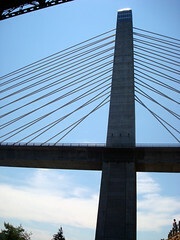 It is the only cable-stay bridge in Maine, and it’s cable-stay, single plane design vastly improves upon the old Waldo-Hancock Bridge which used a cable suspension design. Each of the cables on the new bridge can be individually monitored and replaced if needed. Also, the bridge has the only observation tower on the American continent. There are only two other bridges in the world in fact, that have observation towers and they are in Thailand and Slovakia. Needless to say, I rode the elevator to the top (42 stories) and checked out the view. On a super clear day you can see mountains – Saddleback, among others – that are over 70 miles away. 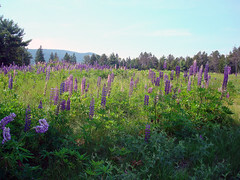 It was a bit hazy when I was there, but I could catch sight of Cadillac, and definitely see Blue Hill. It was very cool. Back on the ground, we headed up to the fort. Fort Knox was built to protect the Penobscot river, and keep foes from sailing up to Bangor. They had a problem with the British during the Revolutionary War and the War of 1812 – they kept sailing up the river and attacking the towns on shore and claiming the land for the British crown. 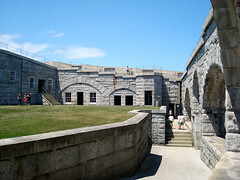 The fort was the first and largest granite fort built in Maine, but aside from being pretty fancy, it never saw active duty. It wasn’t quite finished during the Civil War, although soldiers were stationed there. Soldiers again lived there for a month or so during the Spanish-American War, but no enemy foes ever got close enough. Although there are four batteries and mounts for 135 canons, only about 74 were ever brought to the site. All but two of the canons were melted down to help build bigger, bader things to help aid the World War 2 effort. On the way home from Fort Knox, we swung into Stockton Springs, and visited the lighthouse at Fort Point State Park, the sight of another fort built to protect the Penobscot. This one was built much earlier, and all that is left of it now are grassy mounds and humps where the foundations of the blockhouse and bastions were. 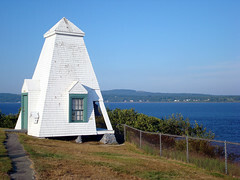 The lighthouse is still in operation, and there is a bell tower with a 1200 pound cast iron bell hanging in it. Have satisfied my historical interests and explored a bit more of my state, I went home thoroughly pleased with my weekend adventures. Since then, I have kept busy hiking and sunning and climbing and kayaking – oh yes, and attending the Strawberry Festival in Somesville. Strawberry shortcake anyone? Mmmm, delicious. There were no festivals to attend this weekend, so I just played outside, but I am keeping an ear and an eye open for good things to do in the coming weeks. I want to do it all and see it all, and I am having way too much fun – which is to say, exactly the right amount of fun. Ah yes, THIS is the LIFE!